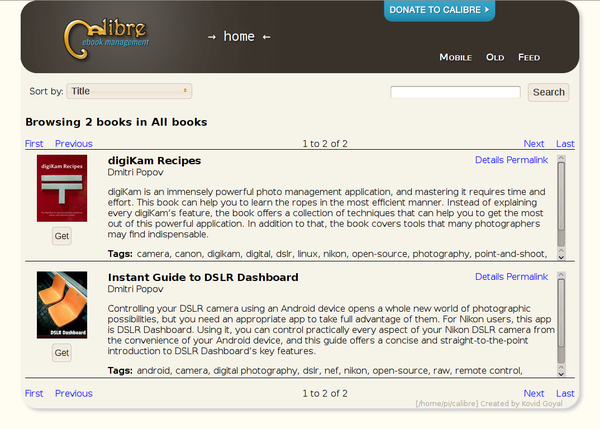 There is probably no better tool for managing, converting, and sharing ebooks than Calibre. You can use it as a regular desktop application for reading and organizing ebooks, but Calibre also features a built-in server for sharing ebooks on the web. In practical terms, this means that you can publish your ebook library on the web and access all your ebooks from any machine using a browser. To publish your ebook library, you can turn Raspberry Pi into a little headless Calibre server. And since a fairly recent version of Calibre is available in the Raspbian software repository, this project can be done in a few simple steps. Once the server is up and running, you can access the published library by pointing a browser to http://myrpi:8080 (replace myrpi with the actual IP address or domain name of your Raspberry Pi server). The calibre-server command supports several options. To restrict access to the published library, you can protect it with a password using the --password option, and to run the Calibre server in the background as a daemon, use the --daemonize option. Refer to the Calibre documentation for a list of supported options and their descriptions. Sorry, can you detail how you set up your RPi? Do you run calibre on a laptop then syncing its library with RPi ownCloud? I've stopped using Calibre on my Pi. Instead I'm using Owncloud (to synchronize my Calibre Library) and COPS (http://blog.slucas.fr/en/oss/calibre-opds-php-server). I find it way lighter.